Our wedding cards are designed exclusively and crafted for all. Our designs are bright and colorful which depicts the occasion ideally. We have one of the finest collection for Jewish celebrations especially for celebration of Bar / Bat Mitzvah occasions. 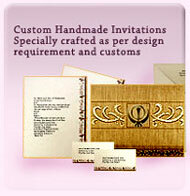 Well crafted designer scroll invitations for every occasion is our specialty.